Beam: 5 ft., 10 in. Draft: 1 ft., 10 in. 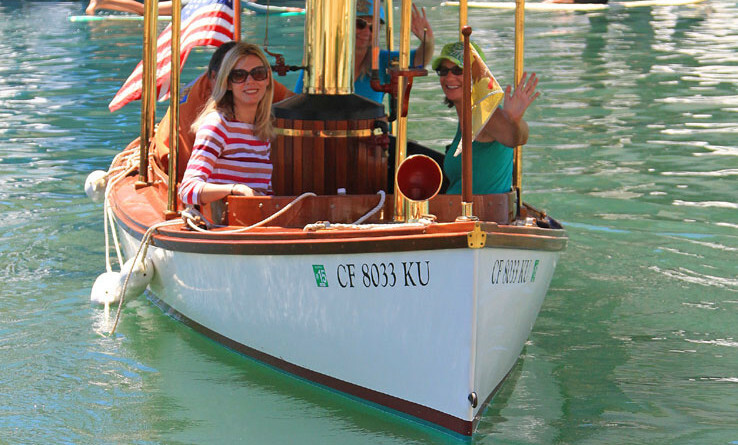 The Back Story:Southern Bay is an exact replica of a Duffy look-a-like built by Truscott Boat Mfg. in 1905. She is about the size of a Duffy boat. The Michigan-built boat became a known brand on the West Coast around 40 years later, when Truscott expanded production in 1945. A Slice of History: Olson said Southern Bay was eventually sunk into a New Hampshire lake after she was no longer deemed useful. What’s Inside: A live steam boiler and two-cylinder steam engine powers Southern Bay with 10 horsepower; she is also equipped with a steam whistle. Southern Bay also features a Teak and Holly sole and varnished Mahogany. “She is adorned with a great deal of polished brass and her green and white surrey top ads to the turn of the century charm,” Olson said. Notes: Southern Bay was voted “Best in the Show” at the Sacramento Delta’s B&W Steamboat Show. She is owned by Jim Kroeger of Pasadena.